Fifteenth-century Italy was a battleground of warring city-states and competing families. The city-state of Milan ranked high in wealth and power. And its rulers, the Sforza family, were as brilliant and ambitious as any of their rivals. In 1462, the Duke of Milan, Galeazzo Maria Sforza, fathered an illegitimate child. The baby's mother was the wife of a friend and follower of the duke. But the birth of little Caterina neither surprised nor shocked the Milanese court. (Note that the portrait shown here may or may not be that of Caterina. Experts disagree.) Galeazzo Maria would eventually have four children born in wedlock and six out of wedlock. Nevertheless, Caterina's birth had broken a social rule. This baby girl would grow up to break many other rules in the course of her eventful life. As a duke's daughter in Renaissance Italy, Caterina was offered an excellent education. In her view, however, this education was not the special privilege it would have been for other girls. From the beginning, Caterina was bored by literature, philosophy, Latin, history and the other subjects her tutors tried to teach her. She much preferred dancing, horseback riding, hunting, and other vigorous activities. Caterina learned more from observing people and events than from reading books. Italian politics were in a perpetual state of turmoil. 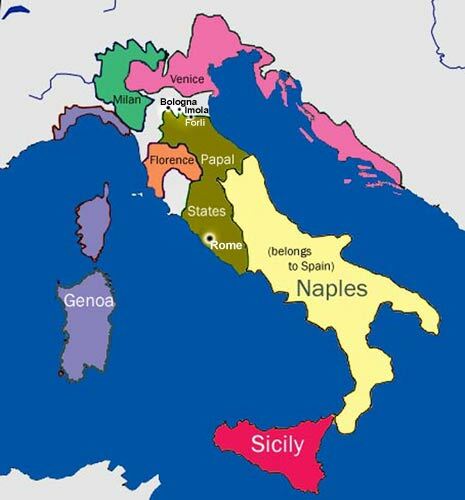 There was no king who ruled all of Italy, as there were kings in Spain, France, and England. Instead, almost every city, large or small, had its own duke, count, or lord; and, each city was trying to gain territory, economic advantages, or protection from its neighbors. From Rome, the pope also played a major role in politics, because he ruled many city-states as well as the Catholic Church. Caterina watched the complex and often violent political moves that made Milan one of Italy's great powers along with Florence, Venice, the Kingdom of Naples, and the Papal states. Young Caterina was ambitious, active, and pleasure-loving. She intended to achieve both fame and fortune--right away, if possible. By the time she was 15, Caterina's childhood had ended. Her family married her to Girolamo [JEER-oh-LA-mo) Riario, a grown man in his twenties. 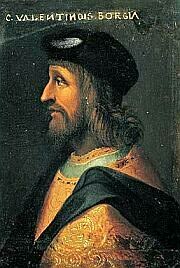 The Riario family had risen to sudden prominence when Girolamo's uncle was elected Pope Sixtus the Fourth. As wife to the pope's nephew, Caterina could expect to gain great wealth. The world would have been amazed if Sixtus had not used his position to advance his family's fortunes. From 1477 to 1484, Caterina and Girolamo spent most of their time in Rome, where Caterina was much admired for her blond beauty. During these years, she also bore four children: Bianca, Ottaviano, Cesare, and Giovanni Livio. Caterina and her husband prospered because of their family ties. The Pope gave the young couple title to the cities of Forlì and Imola, located northeast of Rome beyond the mountains that run up the spine of Italy. These cities had once belonged to other families, of course. But this fact posed little problem for the Riarios, whose wealth and security seemed assured. Then everything changed. In 1484, Pope Sixtus died. Caterina and Girolamo worked hard to control the election of the next pope. In a show of force, Caterina belted on a curved sword and led a group of soldiers to take control of Castel Sant Angelo, one of Rome's greatest fortresses, on the edge of Vatican City. Girolamo, however, acted much less decisively, and the Riarios' candidate lost the election. The new Pope, Innocent VIII, was no friend of the Riarios. From then on, Girolamo and Caterina would struggle even to keep what they had. Caterina and Girolamo withdrew to their cities of Forlì and Imola. Even there, the numerous enemies of the Riario family repeatedly tried to overthrow them. In 1488, the Orsi family succeeded or so they thought. They murdered Girolamo and captured Caterina and her children. Caterina knew very well that she and the children would be the killers' next victims. She showed cool courage in her desperate situation. She managed to escape her jailers through trickery, saying she was going to parley when in fact she was seeking protection. The result was that she recaptured an important fortress that overlooked Forlì. Then she threatened to level the city with her cannon. Her enemies fled, and Caterina emerged firmly in control of the two cities. The next years of Caterina's life were fairly happy ones. She had not loved Girolamo, although they had shared an interest in advancing the family fortunes. Now independent and still youthful at 28, Caterina fell exuberantly in love with Giacomo Feo (JAH-kuh-moh FAY-oh), the 19-year-old younger brother of one of her loyal military commanders. Caterina was a passionate person. For a while, she reveled in her new love and also in her other enthusiasms. She avidly collected herbal recipes, especially those that might preserve her health and beauty. Also, she still enjoyed dancing, hunting, and all forms of activity. Yet there were problems, too. Giacomo became demanding and arrogant, making enemies for himself and Caterina among the cities' noble families. Furthermore, the couple was always short of money. Their way of life was expensive. "Making a good show" was a necessary way to assert status among Italian cities. The troops they needed to defend the cities in dangerous times were a costly, but required, expense. But as soon as Caterina decreed a new tax, the wily citizens of Forlì and Imola found a way around it. Thus both the citizens and the great families were unhappy, whether over taxes or from fear of Giacomo's influence. There were frequent little wars and rebellions, characterized by poisonings, stabbings, secret meetings, and letters fastened to arrows. In 1495, as Giacomo and Caterina rode through the streets of Forlì, assassins stabbed Giacomo to death. Caterina was personally devastated. Instead of collapsing in grief, Catarina Sforza took swift action. She vented her fury on the killers and their families, executing or torturing many and imprisoning more. Then, to stave off her sorrow, she turned to work. She enriched her cities with building projects, creating beautiful gardens and public works. 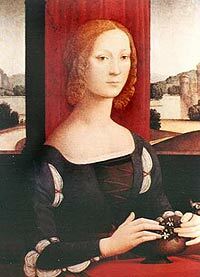 Sadly for Caterina, Giovanni died of an illness in 1498. The timing was unfortunate. His death left Caterina alone to face one of the most ruthless, ambitious, and implacable families in Europe, the Borgias. Pope Innocent had died and been replaced in 1492 by Rodrigo Borgia (BORE-juh), who took the name Alexander VI. The new Pope's son Cesare (CHAY-zuh-ray) set out to increase his family's power by brutally seizing control of central Italy, one small city-state at a time. Cesare was a bad fellow, even by the standards of the time. He poisoned his sister's husband so that he could make a more profitable match for her. On another occasion, he hosted a lavish dinner for a group of his captains whom he suspected of disloyalty, then locked the doors and had them all strangled. With the Pope's power and money behind him, Cesare now took aim at Forlì and Imola. Once before when she had been in danger, Caterina had said, "If I have to die, I want to die like a man!" Now, she seemed likely to do just that. A poet/spy that she employed warned her that Cesare had 15,000 troops and 17 cannons. Still Caterina refused to flee and give up her cities. She announced her determination to withstand Cesare Borgia's siege. Annoyed at being defied by a woman, Cesare offered 10,000 ducats for Caterina, dead or alive. Caterina fought as she had always fought "like a tiger." She put on armor herself and encouraged her men from the city walls. Still, the superior Borgia forces advanced, first to the city, then to its fortress. Caterina and her troops made their last stand in the fortress's great tower. Finally, the inevitable happened, and Borgia's larger army captured the tower. Luckily for Caterina, she was taken prisoner not by one of Cesare's men but by a French captain who admired her beauty and courage. In the end, this French connection saved her life, because the French code of chivalry said that women could not be considered prisoners of war. Still, Caterina suffered greatly before the Frenchman persuaded the Pope to release her. 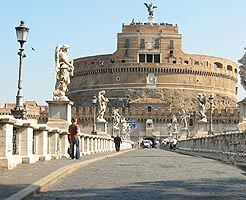 While she was a prisoner, Cesare Borgia brutally raped her and then locked her in a filthy cell in Castel Sant Angelo, the same Roman fortress she had once captured. To gain her freedom, Caterina was forced at last to give up her claims to Forlì and Imola. Though she tried, Caterina never regained control of her cities. She did have one great pleasure, however. Her young son by Giovanni de' Medici proved to be a child after her own heart, fascinated by horses, swordplay, and military activities. She devoted her last years to raising and training him. Caterina died in 1509, just a little too soon to see her favorite son, known as Giovanni dalle Bande Nere, become a brilliant soldier and a national hero. 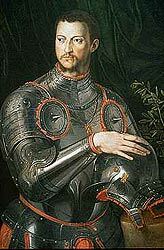 It would have pleased her enormously to know that Giovanni's son, her grandson, became Cosimo the First, Grand Duke of Tuscany. If you want to add this article to your list of favorites or email it to a friend, please use this permanent URL, https://stores.renstore.com/biographies/valorous-warrior. Permission is granted by the author to quote from this page or use it in handouts as long as you include a link back to Renstore.com.